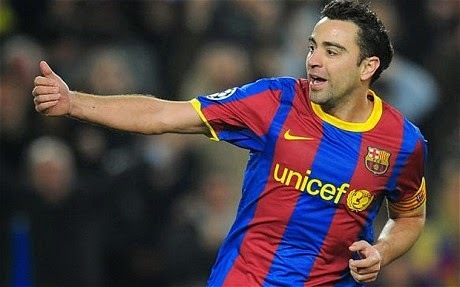 Xavi will be joining former team mate David Villa in New York City. According to reports coming out of Barcelona, Xavi will not be going to Qatar as it was reported during the World Cup; instead he will be joining MLS and signing with the newest franchise New York City FC. He will re-join his former Spanish national team and Barcelona team mate David Villa that signed with the MLS team before the start of the World Cup. This is just the latest signing of a huge football start by an MLS club, but I expect it not to be the last during this off season. NYFC is rumored to also be in the market for Lampard, and it wouldn't surprise me if the MLS newcomers would look at making a big splash in their first season, and come off the chute with these three huge signings. MLS is becoming more and more an attractive destination for players and the American lifestyle is a huge attractive force for them. Living in a city like New York or Los Angeles has its appeal to players that have played their careers in some of the biggest clubs in Europe but are now looking at enjoying a different playing experience as well as personal experience. I believe MLS can offer both. The league is well placed in the world football market, and the displayed provided by the US Men’s National Team has helped and will help raise the profile of the MLS squads and players. A shorter league in duration (April – November), attractive lifestyle, big American cities and its appeal and lucrative deals are all key aspects that will continue to push players to come to this side of the Atlantic. The arrival of Xavi in New York should be finalized very soon, but it is not clear if perhaps he will play in Qatar or even Australia until the start of the MLS 2015 season. Details are not available at this time, but I expect him to make a short stop in Qatar on his way to MLS. One of the greatest midfielders of his generation will for sure add talent, star power and quality to the football played in North America.